NISTCSF.COM is a NIST Cybersecurity Curriculum Consortium (NCCC) created by itSM Solutions in partnership with thought leaders from academia, private industry and government to create standardized NIST cybersecurity training curriculum capable of enabling the NIST NICE cybersecurity workforce required to protect the nations critical infrastructures and information assets. This consortium will provide high schools, community colleges, universities and private training companies access to a standardized set of print, digital book and video NIST Cybersecurity curriculum that can be delivered in a classroom, virtual classroom, as a self paced video or a blended learning training program. The genesis of the NISTCSF program was a Professionalizing Cybersecurity report written by Francesca Spidalieri a Cyber Leadership Fellow at the Pell Center for International Relations and Public Policy at Salve Regina University and Lt. Colonel Sean Kern, USAF, CISSP, Cyberspace Operations Officer, is currently assigned as a student at the Joint Advanced Warfighting School, Joint Forces Staff College, National Defense University. competing, and often confusing professional certifications. The report proposes an alternative to the current, ad hoc, decentralized approach to cybersecurity workforce development. Instead, the report proposes the creation of a national professional association in cybersecurity to solidify the field as a profession, to support individuals engaged in this profession, to establish professional standards and prescribe education and training, and, finally, to support the public good. The American Medical Association (AMA) and the American Bar Association provide similar functions in their respective fields. 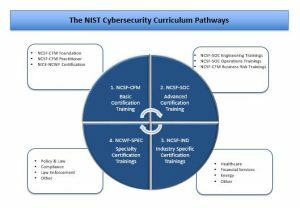 The NISTCSF.COM program is built around the following cybersecurity curriculum pathways. 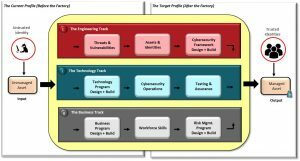 The following companies have banded together to create an agile cybersecurity curriculum development and delivery collaborative that will enable high schools, community colleges, universities and private training companies from across the globe to offer basic, advanced, industry specific and specialty training curriculum that will train and certifiy the global cybersecurity workforce on programs like the NIST Cybersecurity Framework, GDPR and other best practice frameworks and standards. New Horizons Computer Learning Centers the world’s largest independent IT training company with over 300 locations in 70 countries. Additional delivery partners can be found by clicking on the deliver partner tab at the top of this page. NISTCSF.COM inaugural program NIST Cybersecurity Framework – Controls Factory™ Model (NCSF-CFM), was built in partnership with UMass Lowell (UML) a NSA/DHS National Center of Academic Excellence in Cyber Defense Research (CAE-R). This innovative NIST cybersecurity framework (NCSF) training program was built around an NCSF Controls Factory™ (NCSF-CFM) model created by Larry Wilson, CISO in the university president’s office. The program was used to train the engineering, operations and business teams responsible for operationalizing the NIST Cybersecurity Framework Program controls (CIS 20 Critical Controls, ISO27002 etc.) across the university five campuses. The program has since been used by other universities and colleges throughout New England to do the same.